Finally returning (however briefly) to The List for today’s review! On our honeymoon, I read The Marriage Plot, also by Eugenides. I loved it—it made me sort of melancholy, but in a “wow, I just read something awesome” kind of way. It was one of those books that stuck with me. 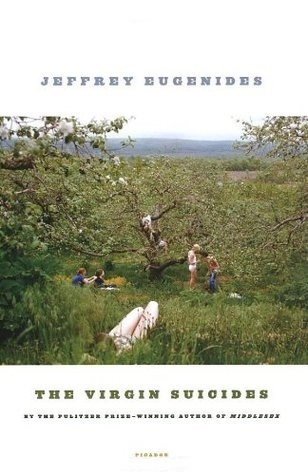 I immediately wanted to get my hands on everything else Eugenides had written, and had heard especially good things about The Virgin Suicides. In a suburb of Detroit, the five eccentric Lisbon sisters—13-year-old Cecilia, 14-year-old Lux, 15-year-old Bonnie, 16-year-old Mary, and 17-year-old Therese—are the subjects of the neighborhood boys’ fascination. Told in the first person plural from one or all of the boys (the narrator is never explicitly named), the story follows the girls as they each commit suicide over the course of a year. The boys, utterly transfixed, gather as much evidence as they can (referred to as “Exhibits #1-97) to figure out why the girls are on this fatal track and seem to be on the verge of saving them—until it’s too late. For a little while, I wasn’t really sure how to feel about this book. It felt a little slow in the middle and I occasionally had some trouble staying awake while reading. But in the end, I was glad I pushed through and finished it. It left me with the same melancholy feeling that I had after finishing The Marriage Plot. The end isn’t exactly a shock—you know from the beginning that all of the sisters commit suicide—but in the back of my mind I really thought that maybe the boys would be able to save them. I quite like Eugenides’ style of writing. It’s not complicated or flowery, but it has a certain highbrow quality that I enjoy. I’m looking forward to reading Middlesex eventually, although it’s by no means number one on my TBR list. I’ve been wanting to read a Eugenides book for awhile now. I started Middlesex way long ago but never really got into it and ended up abandoning the novel. Would The Marriage Plot be a good place to start with him? I would say yes—I think it was easier to get into than The Virgin Suicides. I haven’t read Middlesex yet, so I can’t compare it with that, but I really liked The Marriage Plot. I hope you do too! Haha, thanks! It’s always nice to get new recommendations! I enjoyed Middlesex more than The Virgin Suicides, which left me feeling melancholy too. I’ll have to add The Marriage Plot to my list.